Success, and Holly Holm’s left foot, finally got to Ronda Rousey’s head. The Preacher’s Daughter knocked out the seemingly indestructible Rousey in the second round of the UFC women’s bantamweight championship fight in Melbourne, Australia, on Sunday. Holm’s victory gives Rousey the only loss of her mixed-martial arts career and the UFC its second 135-pound women’s champion in the history of the promotion. 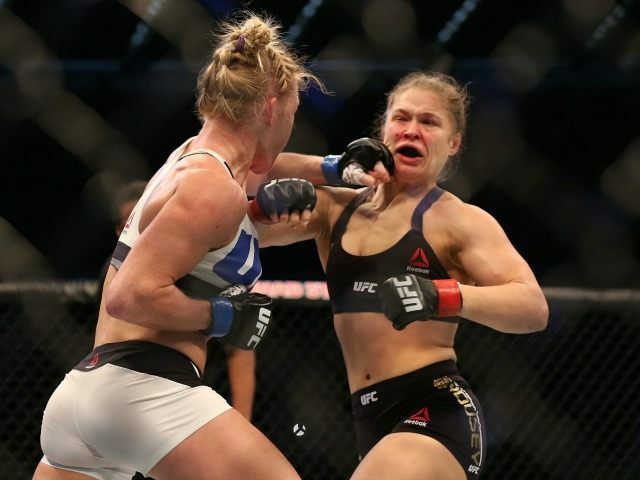 Holm looked like a winner from the moment Rousey refused to touch gloves to the second Herb Dean waved off the fight. The underdog used movement, combinations, and kicks to dominate the first round. She rocked Rousey and even briefly took the champion down. In the second round, an exhausted Rousey stumbled to the ground after missing a punch. The former boxing champ’s punch, followed by a get-out-of-here-kid push to the back of the head, sent Rousey back to the deck. Soon after she rose Rowdy collapsed for good from a Holm high kick. Holm added a few punches to a downed and discombobulated foe as an exclamation point on the perfect performance that ended 59 seconds into round two. The brutal dose of humility in a demolition from a woman deemed a 20-1 underdog at one point follows Rousey instigating a scuffle with Holm at the weigh-ins, ditching a conference call when a reporter asked a question she disliked, discussing her plans for an extended break to relax and make movies after her victory, trolling Floyd Mayweather and Justin Bieber in headline-grabbing celebrity spats, and slamming her challenger for “fake” sweetness. Whereas Rousey went full Hollywood before the fight, Holm holed herself up in an Albuquerque gym. UFC 193 set an attendance record for the promotion and saw 115-pound women’s champion Joanna Jedrzejczyk earn a unanimous nod over Valerie Letourneau. Mark Hunt pleased the crowd down under by finishing Antonio “Big Foot” Silva in the first round of their anticipated rematch.